Like most of Wood’s other lithographs, this work was made through Associated American Artists (AAA), a firm founded in 1934 to promote American art and artists by sales of fine art prints, distributed through retail stores and the postal service. Wood was one of numerous prominent artists who created such works, which were originally sold for $5 each, not a small amount in the Depression-era 1930s. Wood’s first print for AAA was made in 1937, and he ultimately created nineteen different such works. Given his untimely death in early 1942 from pancreatic cancer, these works are a crucial part of his mature oeuvre and comprise around a quarter of those works. Wood during these last years of his life made nearly twice as many prints as he did oil paintings. The Hillstrom Museum of Art has a complete set of examples of all nineteen of the lithographs, largely through the generosity of donors Dr. David and Kathryn Gilbertson, who donated or purchased eleven of the works for the Museum and were co-donors of four more with Hillstrom. 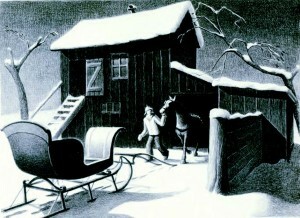 In this image, the artist depicts an image of a rural scene with a man leading a horse to hitch it to an open sleigh. The print has a nostalgic quality that reminds of Currier and Ives images, which were a major influence on Wood and to which he favorably compared AAA’s project of marketing prints. As is the case with many of his prints, the artist creates subtle texture through patterning, a practice that may be linked to the crackle pattern on Chinese willow-pattern plates owned by Wood’s mother that had stylized and charming designs that influenced Wood. The stylized quality creates an artificiality that is heightened by the oddly-narrow dimensions of the barn from which the horse emerges, which looks almost more like a theatrical backdrop than a real structure on a farm. Text from the catalogue for the exhibition The Eight, The Ashcan School, and The American Scene in the Hillstrom Collection, presented in the Hillstrom Museum of Art February 25 through April 21, 2013.